Dental Implant Surgery|5 MUST KNOW considerations! Dental Implant vs Bridge – Which is Better? Sensitive teeth are a common problem. When you have ice cream or a sip of hot coffee, does the sensitivity from your teeth send you through the ceiling? When you brush your teeth, do you dread the sensitivity when the bristles hit certain areas? There are a variety of causes of sensitive teeth. It can be caused from tooth decay (cavities) teeth that are fractured or have micro cracks. Or you may have dental fillings that need replaced because they are leaking and worn out. Perhaps your gums are receded because of gum disease or traumatic forces caused because your bite is not balanced. Other causes of sensitive teeth can be worn tooth enamel from grinding and gnashing of your teeth (the stresses of life can cause this). Or maybe you have an exposed tooth root. Sensitive teeth need to be and can be treated. The treatment for sensitive teeth depends on what is causing your sensitivity. Sedona dentist Roy Daniels invites you to make an appointment to diagnose your tooth sensitivity cause, and get treatment for it. Dr. Daniels may suggest a variety of treatments for your sensitive teeth. Desensitizing toothpaste for areas where dentin has been exposed, along with a soft bristled toothbrush and less aggressive brushing. Our dental hygienist can give you excellent tips. 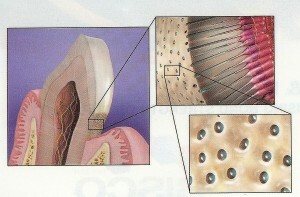 Surgical gum grafts are sometimes suggested when you have an exposed root. If your tooth has lost gum tissue from the root, this will protect the root and reduce sensitivity. Getting this treated early can not only reduce your tooth sensitivity, but save you from loosing that tooth later from gum disease or root cavities. 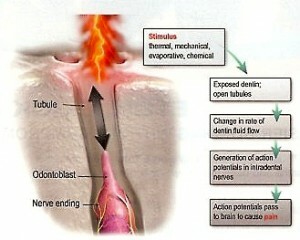 A root canal if your sensitive tooth is severe and persistent. Make an appointment now to get your sensitive teeth looked at. It’s easy, and your dental pain does not have to continue. Example of a tooth that has some recession near the gum line and is sensitive to cold. Call us if you have sensitive teeth.